It has been a great & rewarding Sunday. * Lunch tweet-up at FullHouse, NZX with @redsheep @geminianeyes @MrG82 @spinzer, it's great to make friends with great new people. Twitter did and is doing a good job in bringing strangers together and the next thing you know, they're friends! * Movie tweet-up at GSC, One Utama - Cloudy with a Chance of Meatball with the lunch gang, except @geminianeyes. 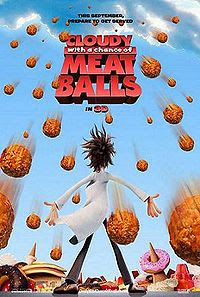 Honestly speaking and totally unexpected, I'm bewildered and convinced to give a 5/5 stars to Cloudy with a Chance of Meatball, a 2009 animated comedy, fantasy movie, written and produced by Phil Lord & Chris Miller, based on the book written by Judi & Ron Barrett. 1. Impressively colorful visuals with rich, smooth texture. I thought I'm watching it in 3D. 2D is good enough to get me smitten, wide-eyed, and glued to my seat throughout the whole 90 minutes. The animation and every single detail of the characters, including the different food items are so vivid and lively. 2. This is a great, lighthearted comedy for both kids and adults with jokes and funny liners so good in taste and shape and are genuinely funny. A perfectly chosen cast helps to bring the movie into momentum. There are kiddie moments but for the young-at-hearts, believe me, you'll get cracked up and laugh for a whole 60 minutes or so. 3. Very educational and it boils down to this: How far would you believe in or sacrifice for your loved ones in order to stick to and realize your dreams and passions? Think about it. This is a very good movie to instill the importance of family values in the young ones. This is a very fun, lighthearted, valuable, and rewarding movie. Never have I felt so satisfied walking out of the cinema after watching an animated movie (apart from UP). Great family movie, great movie for movie-get-together, great movie for those who don't trust in what they can get from animated movies. Highly recommended. Read here for detailed synopsis. Read "An Insightful, Irreverent Interview with the Directing Team Behind Cloudy with a Chance of Meatballs". I'd still say, go watch. You won't regret it. I promise this. I'll watch it again.